I broke a string, originally uploaded by Rowan Peter. The G string never stayed in tune. 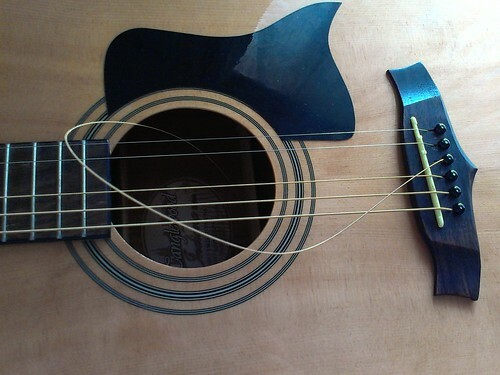 I broke the string while I was trying to tune it. Next stop? The guitar shop. 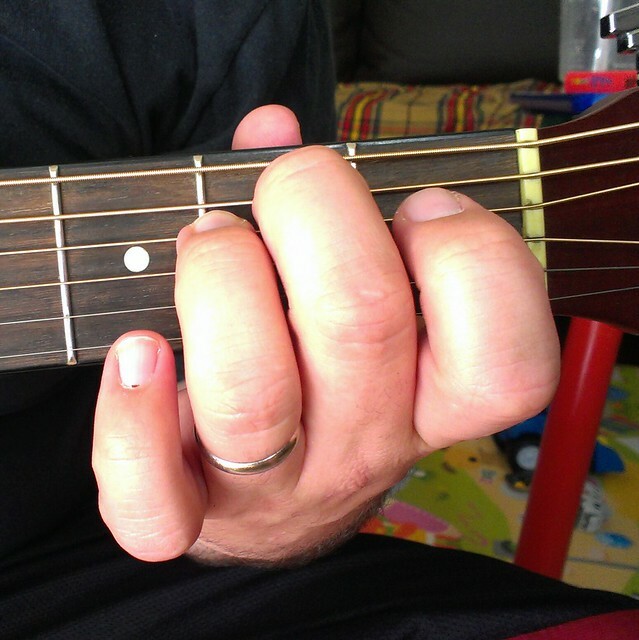 Here are my first attempts at playing the D major and E minor chords. Pretty bad. 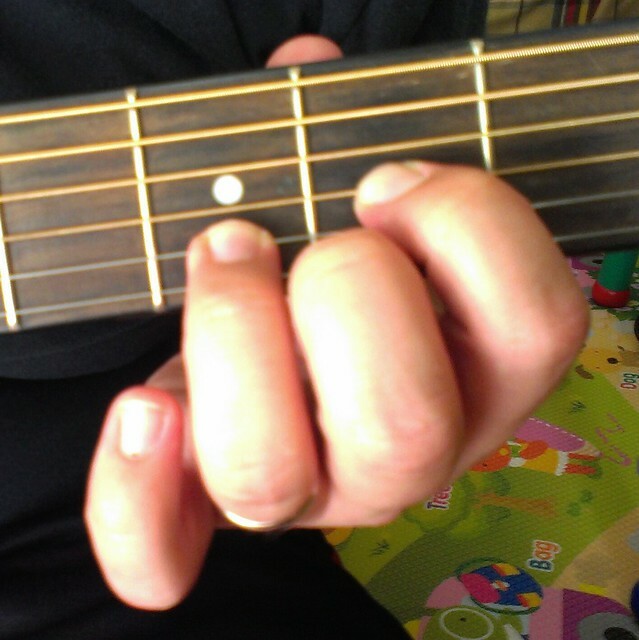 I’ll continue to practice slowly alternating between the two chords and then I’ll attempt to record an Asynchronous Jam with the Class Recording: Strumming D major and E minor. Then, I’ll learn A minor. My new D’Addario Medium Light strings. They have a full, bright tone? 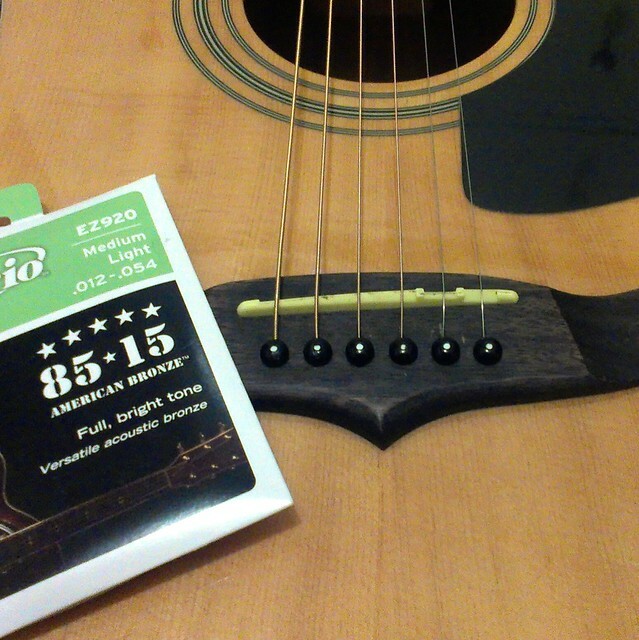 It took some time, but I was finally able to string my guitar with new D’Addario Medium Light strings. This is the process I worked through. Using pliers, I gently tugged the bridge pins from the bridge, removed the old strings and then placed the ball end of each new string into their respective bridge hole. I then inserted the end of each string through the hole of each tuning-post. Next I had wind each string around its post. I found an informative video on YouTube demonstrating how to string a guitar and do a funky little loop around each post. I had to watch it a couple of times just to get the direction of the loop right. All up, it took me about 45 minutes to finish stringing my guitar. Now it’s time to tune it. Guitar Tuna! The polygraph test line-on-graph-paper style, individually labelled strings and Tune up or Tune down instructions made it easier for a total guitar beginner like me tune each string. I had tried using a number of different guitar tuner apps to tune my guitar. I had even tried using the web-based guitar tuner. I felt like they were more suited to people with a bit more guitar experience than me. That’s ok. I just needed something with a little more instructional scaffolding. That’s why I liked I Guitar TUNA! I was able to select the string on the app I wanted to tune, pick the same string on the guitar and then adjust the tuning key according to the feedback provided by the coloured line drawn by the pen on the graph paper and the Tune up or Tune down instructions that were displayed. Once the line was drawn in the middle of the graph paper and coloured green I knew that the string was tuned. I then followed the same process for the remaining strings. 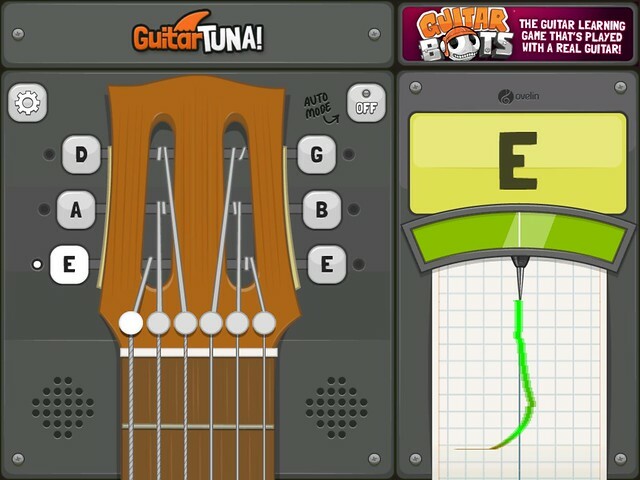 With more experience and the need to play songs with alternate tunings, I might find Guitar TUNA! restrictive, but for now it’s my tuner of choice. The story of my guitar, originally uploaded by Rowan Peter. The story of my guitar is plain and rather unglamorous. I wanted to take part in the Introduction to Guitar course, so I went to a nearby pawn shop and then bought an acoustic guitar that seemed to be in a reasonable condition and was within my very limited budget. 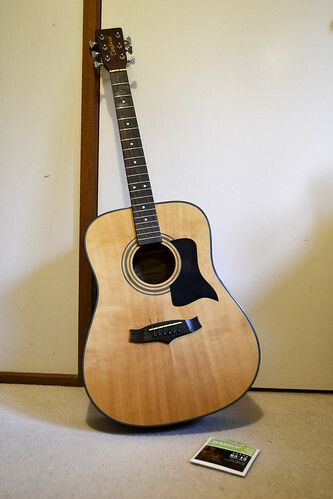 The guitar happened to be a Tanglewood Indiana Series (TW28ST-USA/NA). It was missing a string and the fretboard was filthy due to some questionable maintenance from the previous owner(s), but I didn’t want these minor issues to get in the way of my guitar adventure. Besides, some new strings and a serious clean with a soft cloth and some citrus cleaner would remove any remnants of the past. After a serious cleaning the guitar would have a new owner. Me. It’s now Monday night. I’ve cleaned the fretboard and body with a soft cloth and citrus cleaner. The funk, the gunk and the grime have gone. I’ve removed the old strings and thrown them away. All that remains is to string the guitar, learn how to tune it and then learn how to play. They’re the next chapters in the story of my guitar. I can’t play guitar. 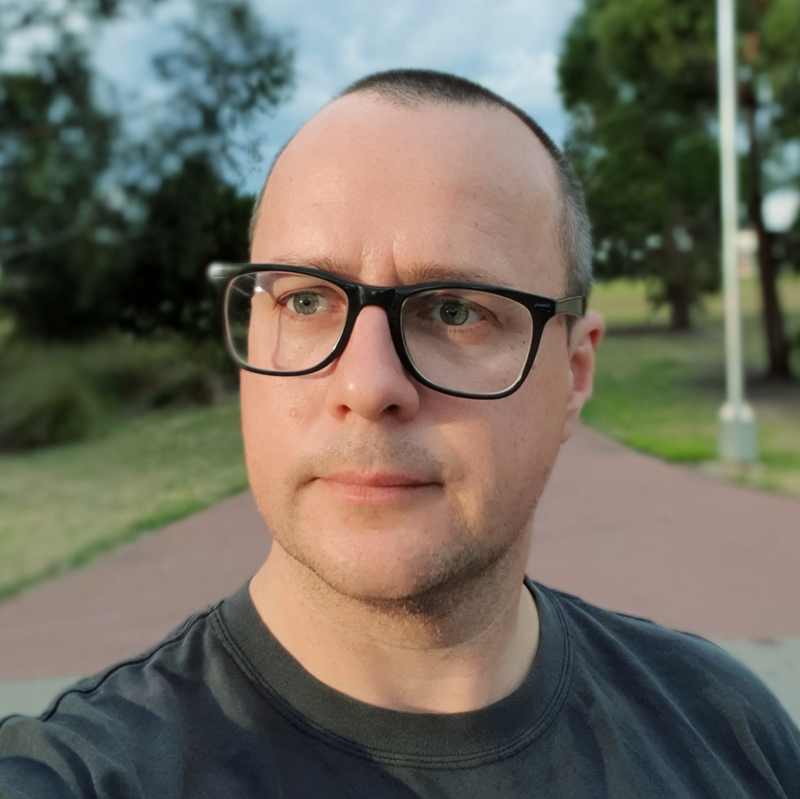 I decided to change that by buying a second-hand acoustic guitar and then signing up as an open online student to the Introduction to Guitar course. The Introduction To Guitar course is going to be challenging and fun. I hope it’s not too painful to watch and listen to me learn how to play the guitar. Let’s see how it goes. Bobbin’ and weavin’ (and let the good get even), originally uploaded by Rowan Peter. Bob takes cover behind a car in a Heat themed Gun Crazy GIF celebrating DS106 GIFfest. There’s a lot of crazy gun action in Heat that I’m sure can be sampled for an animated gif. This animated gif sampled a shot from the gun battle in the street scene. I particularly like how the camera mirrors Bob’s movement from behind the car. Automated holster action from Robocop, originally uploaded by Rowan Peter. Automated holster action from Robocop for a Gun Crazy GIF celebrating DS106 GIFfest. Robo’s gun spinning and holstering sequence is reminiscent of a Sheriff in a Western. A lone (rebuilt) lawman responsible for cleaning up the town. Moo Moo Says The Boid GIF, originally uploaded by Rowan Peter. A dancing bird inspired Moo Moo Says The GIF for DS106 GIFfest. If only I read the assignment brief correctly. Animation is restricted to COWS ONLY. Other animals are not included in the assignment brief. Maybe, just maybe these boids could be considered an unofficial remix. You’ve made my GIFlist, originally uploaded by Rowan Peter. A shopping themed You’ve made my GIFlist for DS106 GIFfest. Lt. Vincent Hanna demonstrates how to feel the music, originally uploaded by Rowan Peter. A Heat themed The Music Of GIFs for DS106 GIFfest.